Don Lomax's critically acclaimed Vietnam Journal series returns with all new stories. 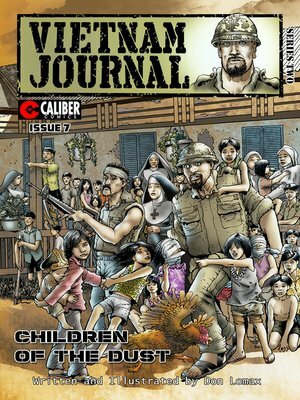 THIS ISSUE: "CHILDREN OF THE DUST" - 'Journal', wounded by a stray bullet, is taken in by Sister Emile and the orphanage Nuns for treatment. 'Journal' and Lindsey form an instant attachment for the Nuns and the orphanage of ethnic Vietnamese children, caught in the middle of the warring factions, and tagged for annihilation by the brutal butcher of Cambodia, and new President, Lon Nol. Desperation and panic envelop the group of refugees in a wild race for the border and sanctuary in the home of their ancestors, South Vietnam. But they are not alone. There is someone watching over them. And with help from above, the innocent children have a chance to survive the desperate situation.